Thanks for joining us at CACCLC 2018!! This year, we had 110 campers and 5 religious (priests and sisters); 39% of our campers were attending CACCLC for the first time. 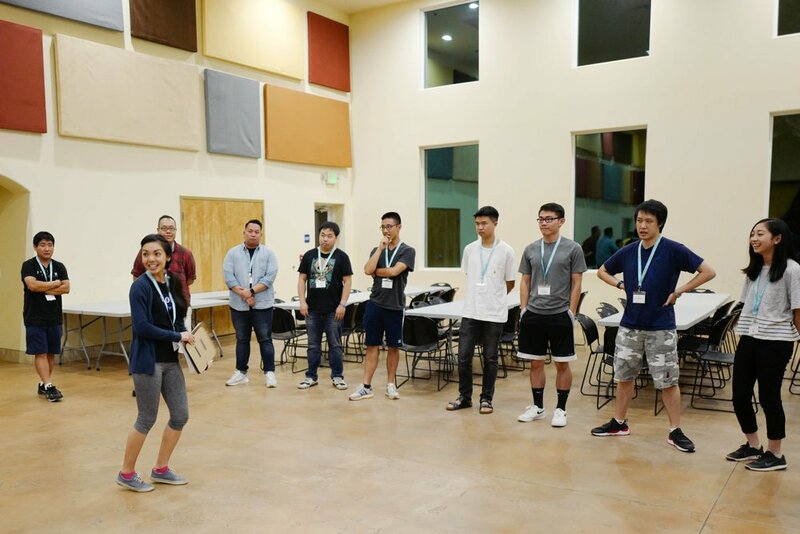 While most campers came from all over California, we were also excited to host campers who flew in from Texas, Michigan, Nevada, and Canada! Check-in began with some awesome swag: a t-shirt, tote bag, eye mask and ear plugs, CACCLC stickers, lanyard, and nametag. We had dinner, played some icebreaker games, and went to mass together at the new chapel at night. Fr. 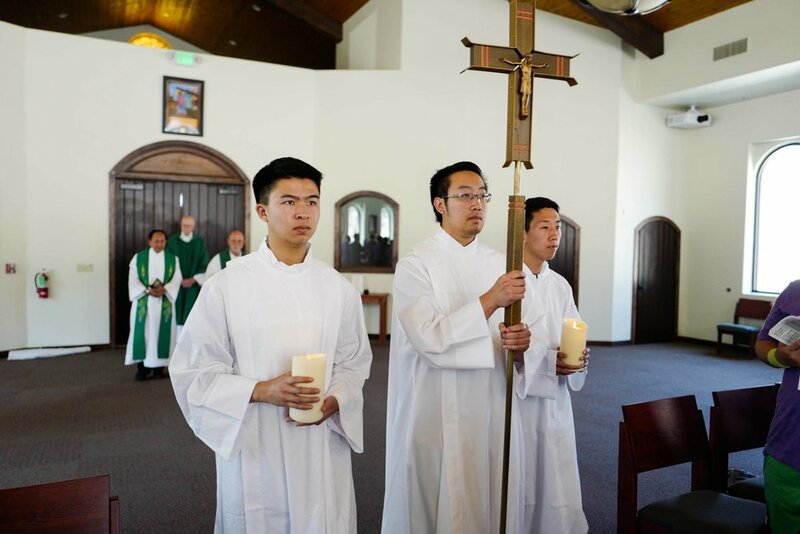 Ken celebrated mass, and during the sign of peace, he taught us a different way to share the sign of peace—passing it on starting from the altar to the people. 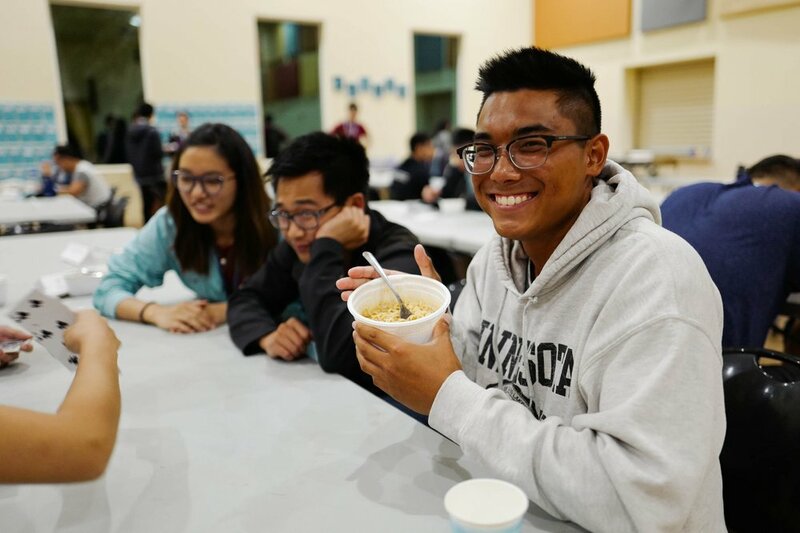 After mass, it was free time, so some headed to bed while others stayed up playing board games and eating instant ramen! 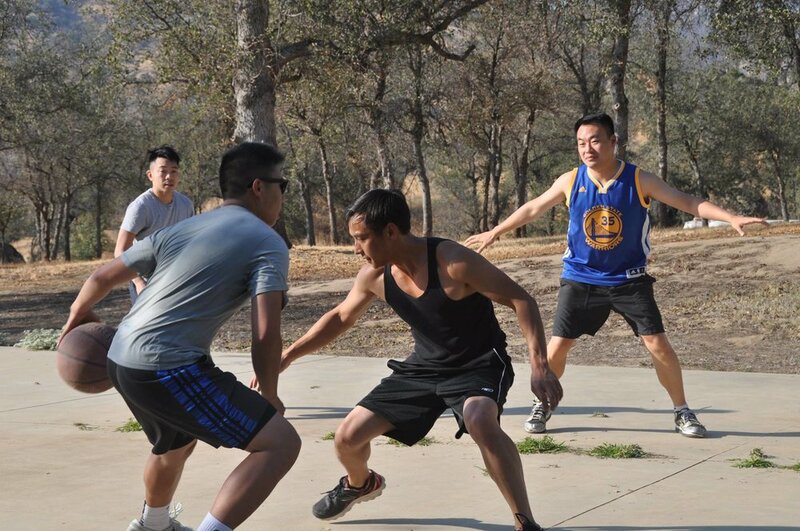 On Saturday, we started with an optional morning prayer and morning exercise. We met our small groups and created team chants, followed by breakfast and introductions. Fr. 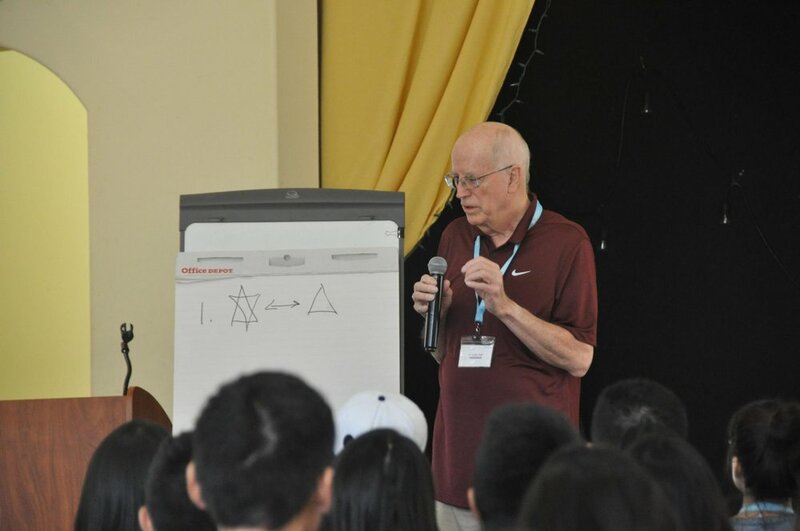 Jim’s first talk was an introduction to the core of Christianity/Catholicism. Fr. Jim reminded us that our faith came from Judaism, and said that we can be sacraments for others. He talked about the role of Mary and the saints, the purpose of hierarchy, and the stages of growth. Our journey in faith takes time, and it requires all of us: head, heart, and hands! We discussed more in depth in our small groups, and regrouped as a large group afterwards to share our reflections and ask more questions. After, Fr. Jim led us in a “walkthrough mass” where he paused throughout to explain the different parts of the mass—he talked about the origin and meaning of different actions and words, deepening our understanding of these things many of us may have taken for granted. After lunch, Fr. Jim gave his second talk about “The Heart.” He reminded us of the Great Commandment: to love God, and love your neighbor. We learned that our relationships should be both face-to-face and shoulder-to-shoulder. He talked about compassion (to suffer with someone), loving your enemies, and love & sexuality. He brought up community and how it is both a gift and a task that takes time. 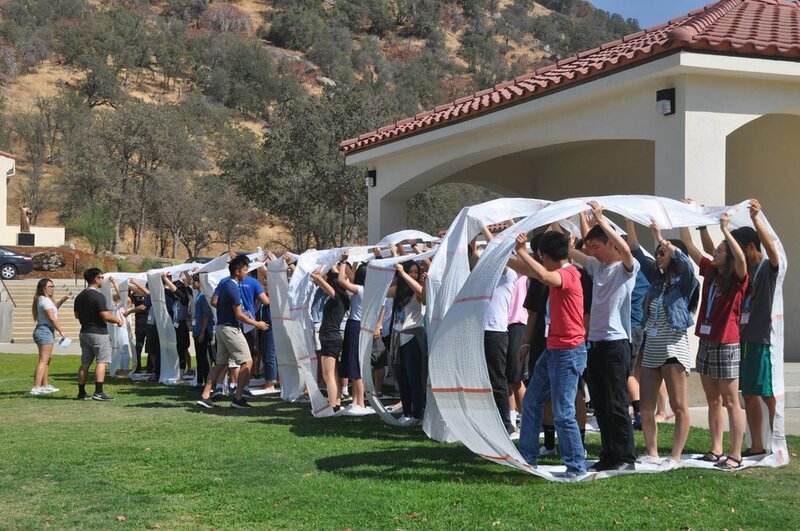 Then, we had our annual epic large group activity - this year, it was a relay ending with short team skits! After the large group activity, we had free time. 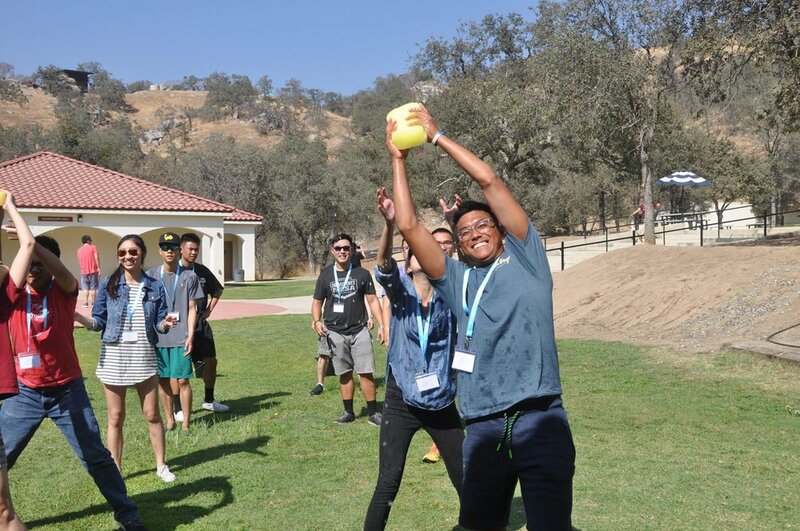 Campers played board games, played spikeball, went hiking, played basketball, took naps, enjoyed the pool, chatted with each other, and ate snacks. After free time, we met new people over a delicious dinner. After dinner, we had a workshop panel about spiritual direction featuring Fr. Rod and Sr. Danielle (from the retreat center) and our very own camper Kristen! They answered questions like: What’s the difference between a spiritual director and a therapist? Do you need to pay a spiritual director? How do you go about finding a spiritual director? What do you talk about? Workshop 2 was a talk by Fr. Ken about discernment, who shared more about his own struggle with addiction and his recovery. He recommended that during discernment (about your vocation and anything else), you should speak to someone you trust (like a spiritual director), and ultimately make a decision (instead of discerning forever). 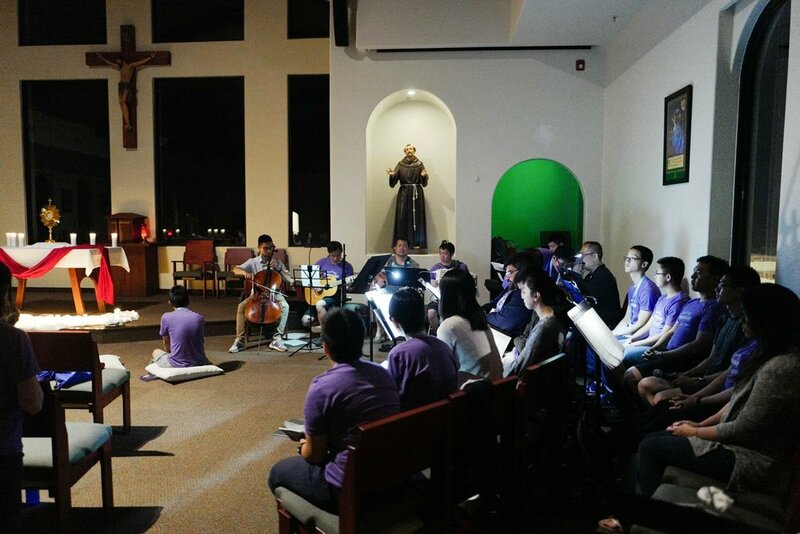 We ended the night singing praise & worship music during adoration. 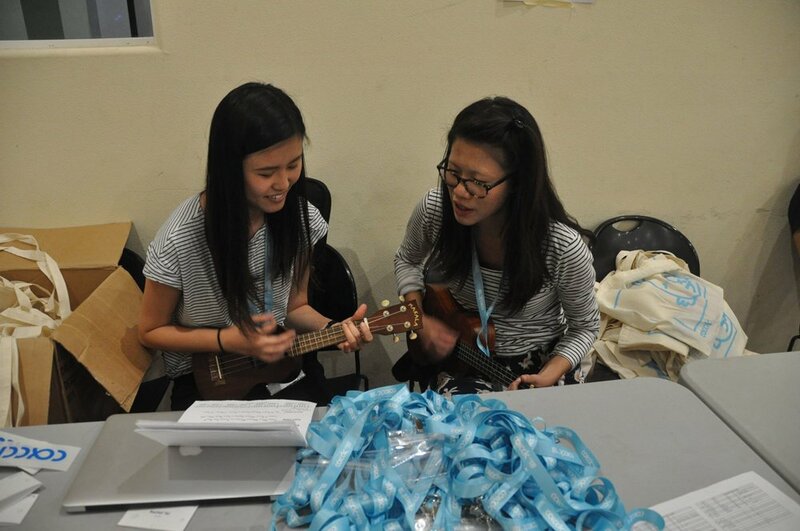 Sunday began with optional morning prayer and fun partner morning exercises led by Claire and Helen. After breakfast, we heard Talk #3 from Fr. Jim on “The Head,” where he encouraged us to take time to study the Bible with good commentaries, read spiritual books, and “pray the prayer that’s given to you” because God speaks to us in different ways. He emphasized that you can’t separate the head from the heart, and quoted artist Sister Corita Kent who said “to understand is to stand under, which is to look up, which is a good way to understand.” He said wisdom is when you have good judgment AND good timing. In our small groups, we reflected on our own level of wisdom. 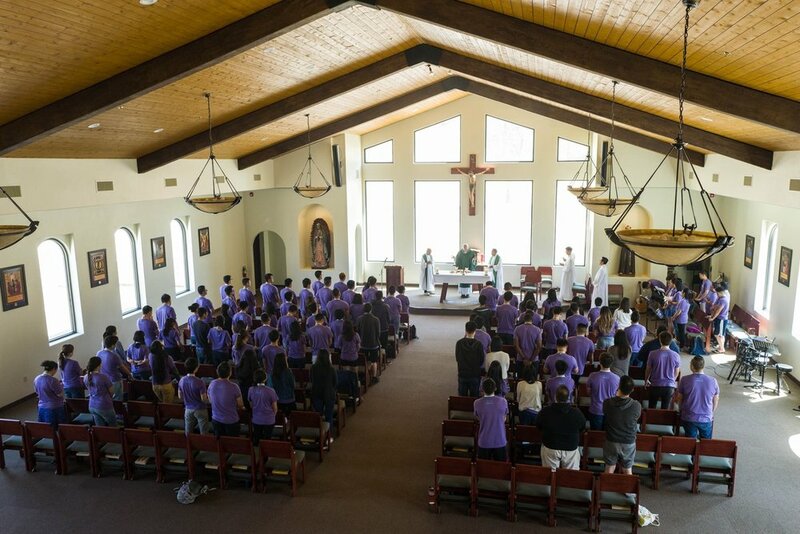 We had mass in the morning, followed by lunch. 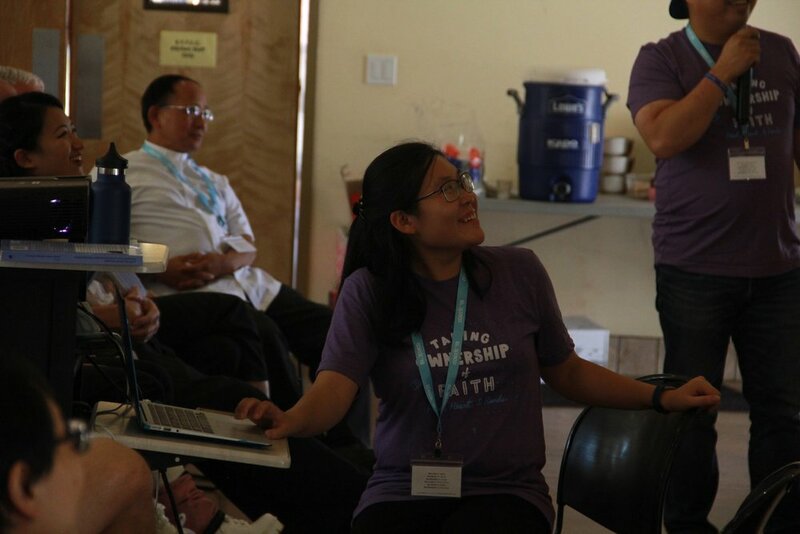 Unfortunately, technical problems prevented us from a successful video conference call with our sister camps WCCCLC & ECCCLC, but Cecilia walked us through all the camp’s presentations. We ooh-ed and ahh-ed at their beautiful campsites in Canada, and were fortunate to have Rey from WCCCLC join us at CACCLC so he could talk through their presentation! After the conference call, we had a workshop from Fr. George who drove all the way from Berkeley to join us in Three Rivers for a couple hours to talk about Catholicism in the Global Church, providing some interesting stats about world religions and putting our faith (and our Chinese background) in context. In Talk #4 on “The Hands,” Fr. Jim talked about some important practices of the Christian Life like the Corporal Works of Mercy and Catholic social justice principles. He began with some wisdom from China: “When I hear, I forget. When I see, I remember. When I do, I understand.” Taking ownership of our faith means it shouldn’t be a private matter between just ourselves and God—we cannot remain passive in our own comfort (like taking opium to feel good). We must remember that our faith is in this world. 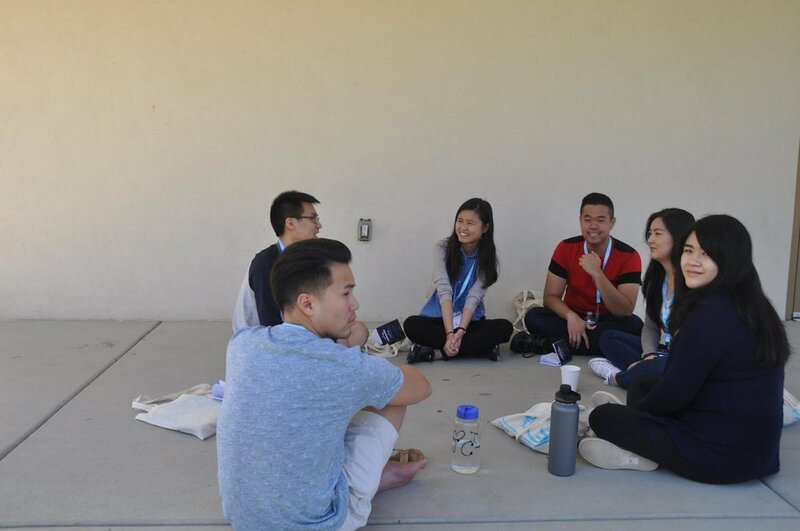 He discussed the 9 principles of social justice and challenged us saying, “if you don’t risk anything, what can you say you’ve done?” In our small groups, we discussed what scares us about doing justice. The evening progressed with another block of free time in the afternoon, dinner, and Office Hours with Fr. Jim where he answered questions that campers had submitted throughout the weekend. 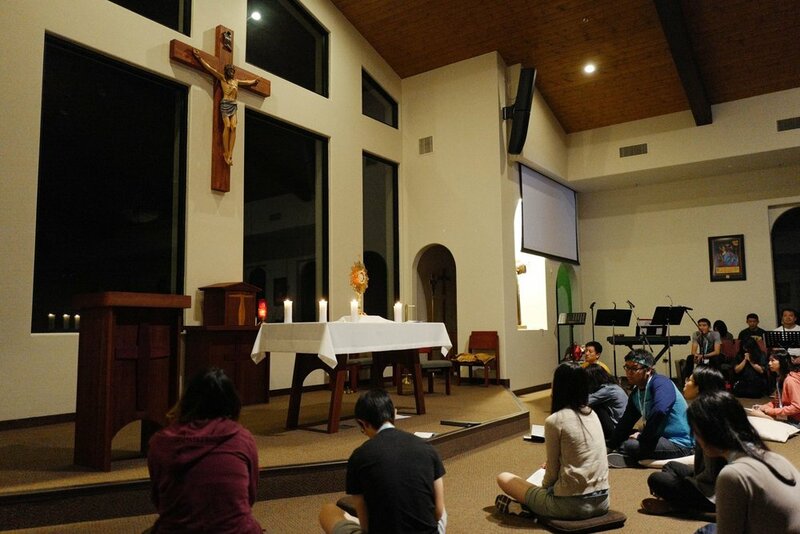 At night, we sang Taize songs during Adoration, and ended with an optional Night Prayer. Many campers stayed up late at night to write affirmation notes to each other—an annual camp tradition! More ramen was eaten - thanks to Cecilia and Jonathan for the great snack selection this year! Our last day began with a later start, with breakfast and camp evaluations. 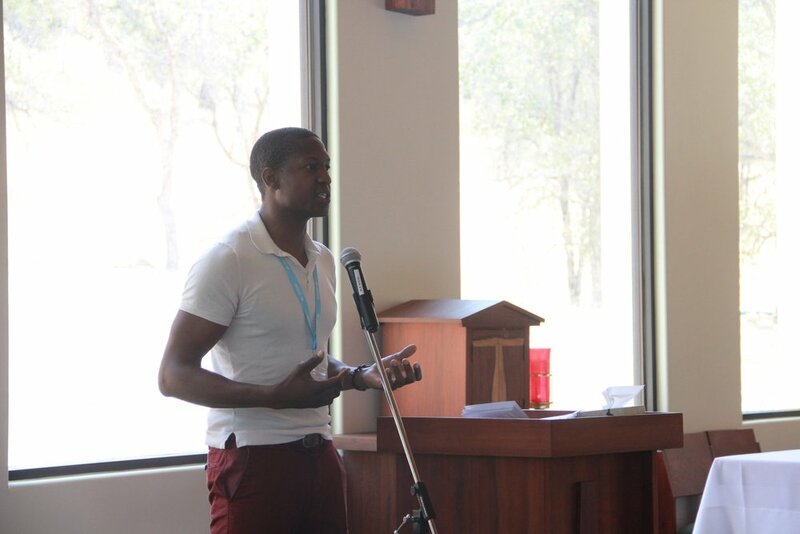 We had Mass and a quick closing talk by Fr. Jim. Our ExCo overalls Cecilia and Jonathan shared some closing thoughts and awarded Lily with a special ExCo appreciation award for her hard work on design! Prizes were also awarded to the winners of the Promotion Team’s photo caption contest. After, several campers shared heartfelt and touching testimonies about their experiences at camp this year. It was a joy to hear how campers felt welcomed, how they made new friends and had meaningful conversations, and how they felt God’s presence. Thank you to all those who bravely shared with open and honest hearts! After lunch, we all took group photos before heading back out onto the road. 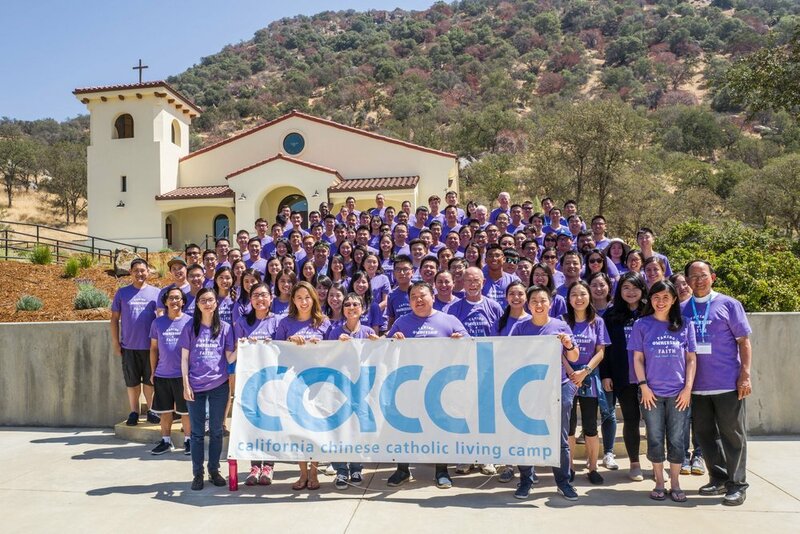 As the 2018 ExCo team, we want to thank all of YOU campers for coming to camp this year, especially the first-timers who gave CACCLC a chance. We hope that you all had a fruitful experience and hope to see you next year — save the date for Labor Day 2019 (Aug 30–Sept 2)!! In the coming months, we’ll be assembling the ExCo team for 2019, so stay tuned if you indicated interest in being on ExCo or Support next year. We keep in touch via our Facebook group so be sure to join the group for all the latest announcements! Remember that community is super important, so check your camp booklet (pg. 74) for local communities and bible studies you can join. 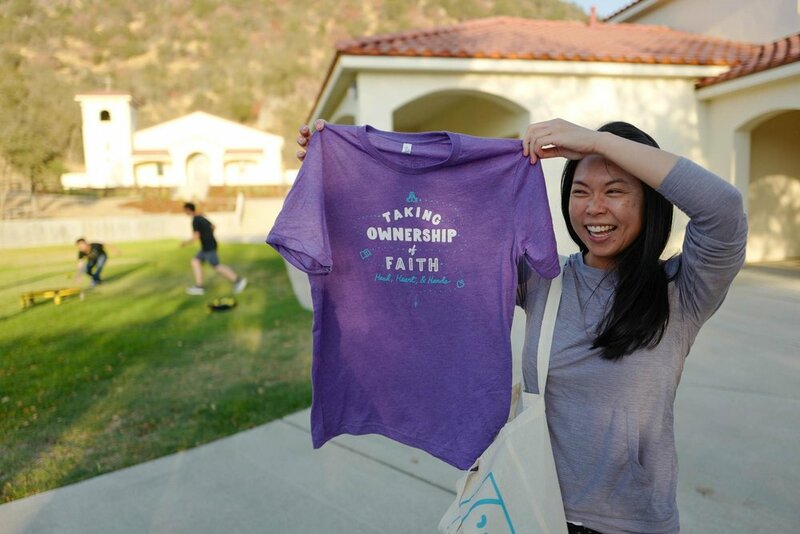 Now go forth and take ownership of your faith with your head, heart, & hands! Only a few days left until CACCLC! 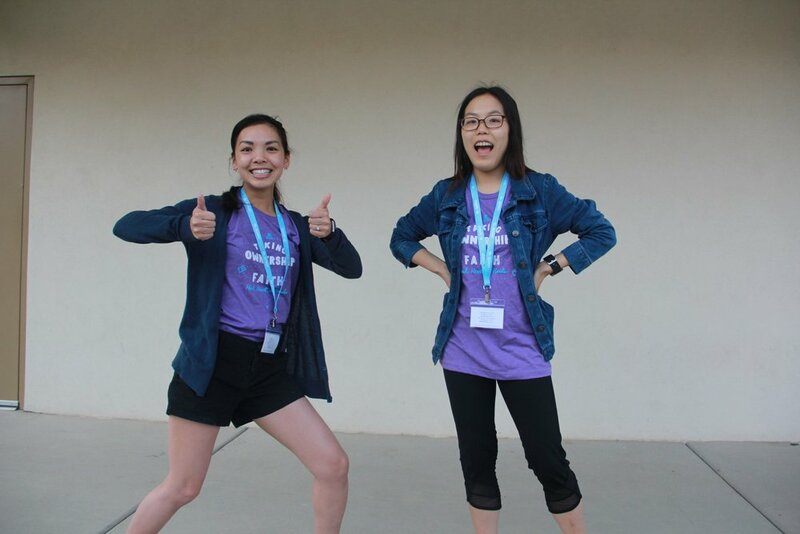 Check your emails for the Welcome Packet, and if you requested a carpool, you should have received a separate email with your carpool group! Your small group leader will be reaching out to you within the next few days. Please email cacclc2018@cacclc.org if you did not receive the Welcome Packet or carpool email. Packing for camp? Enjoy this What to Bring video for some items to bring to camp! Cute one-piece swimsuits, tankinis, and swim dresses drawing inspiration from Audrey Hepburn—timeless and feminine. Ethically made in LA and made with eco-friendly fabrics. Founded by a Catholic woman! Seea is actually a women's surfing brand, so they have one-piece swimsuits and even rashguards and wetsuits if you prefer longer sleeves! I personally really like their fabric pattern combinations and cuts. Seea suits are also a 100% Californian product, and some of their suits are exclusively designed for Anthropologie! Speaking of Anthropologie, they have a few cute one-piece swimsuits too! I like this giraffe Onia Kelly One-Piece Swimsuit and this fun kiwi-like Onia Kelly One-Piece Swimsuit. Okay, so maybe you don't want to shell out $100-150 for a swimsuit, and your budget is more like $30-50. Target.com has a decently large selection of one-pieces and tankinis, thanks to these being in fashion right now. My favorite finds from Target include this laser-cut high neck one and this cute swim romper. If you just want to find the most affordable swimsuit, I am fairly certain you can find a solid basic one-piece swimsuit for a decent price ($10-20?) on the infinite abyss that is Amazon. And maybe it will even ship in 2 days if you have Prime! Wait, what is modesty and why should I care? The way we dress says something about ourselves to the world. Through modesty, a woman tells the world that she has more to offer than her body—and lets everyone focus on her as a whole person instead, revealing her dignity and value. How we present ourselves commands the reverence we deserve and presents the opportunity to be truly cherished, valued, and loved. Sisters, I pray you know how good and beautiful you are, and that you use your beauty to always lead others to Christ. Ascension Presents: Leah Darrow on Modesty - Leah Darrow, former contestant of America's Next Top Model, explains the Catholic approach to modesty and how it's about more than just fashion. Curious what songs we'll be singing for Praise & Worship? Here's our set list on YouTube and Spotify! And check out "The Do's and Don't's of Praise and Worship" by Julie Lai for some tips on how to approach P&W (fun gifs included)! We'll be singing some Taizé music at camp...but what is Taizé? The Taizé (pronounced like tay-zay) community is an ecumenical monastic order in Taizé, France, made up of 100+ brothers from Catholic and Protestant traditions. The songs are short phrases (usually lines from/inspired by Scripture) that we repeat over and over for contemplation/meditation. 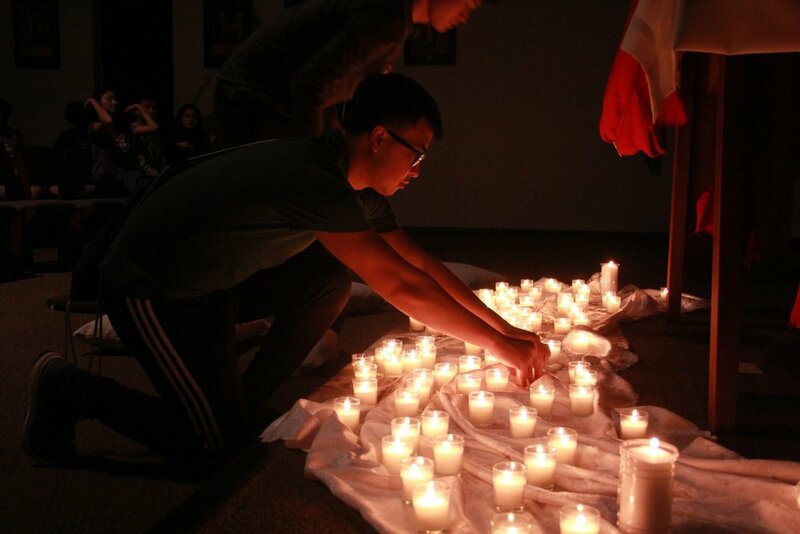 Taizé tends to be a favorite part of CACCLC for many — we hope you enjoy it!